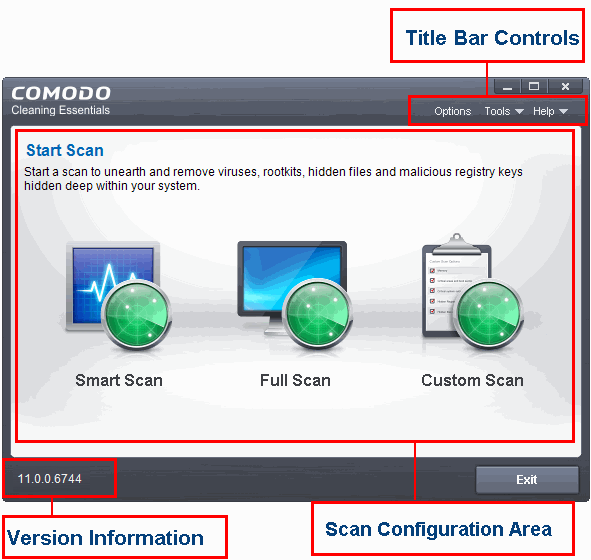 Comodo Cleaning Essentials' streamlined interface provides fingertip access to all functional areas of the software. Smart Scan – A targeted scan of the most important areas of your computer. Areas scanned include system memory, auto-run entries, hidden services, registry keys, boot sectors, and other critical areas. Full Scan	– Scans every file and folder on your system. Custom Scan	– Create your own scan of specific files/folder or drives. Options	- Configure various settings in the application. Tools	- Manage quarantined items, trusted vendors, and the virus database. Also contains shortcuts to open KillSwitch and Autorun Analyzer. At the bottom of the main interface, you can see the version information of the software.